^ Braj B. Kachru (2008), Language in South Asia p.302, Cambridge University Press, ISBN 978-0-521-78653-9. ^ TDIL.mit.gov.in. TDIL.mit.gov.in. [2011-06-13]. （原始内容存档于2011-07-16）. Masica, Colin. The Indo-Aryan Languages. Cambridge: Cambridge University Press. 1991. ISBN 9780521299442. Snell, Rupert. Teach Yourself Beginner's Hindi Script. Hodder & Stoughton. 2000. ISBN 9780071419840. Salomon, Richard. Writing Systems of the Indo-Aryan Languages. (编) Cardona, George; Jain, Dhanesh. The Indo-Aryan Languages. Routledge. 2003: 67–103. ISBN 9780415772945. Verma, Sheela. Magahi. (编) Cardona, George; Jain, Dhanesh. The Indo-Aryan Languages. Routledge. 2003: 498–514. ISBN 9780415772945. Wikner, Charles. 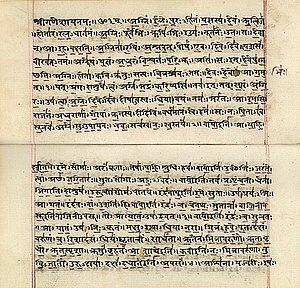 A Practical Sanskrit Introductory. 1996. Lipikaar - The indic script typing tool with support for Devanāgarī through a Windows desktop executable or Firefox Extension.